Celebrating nearly 100 years as The Bible of the Mechanical Industries , the book brings together volumes of knowledge, information and data gathered, revised and improved upon from experts throughout the mechanical industries. 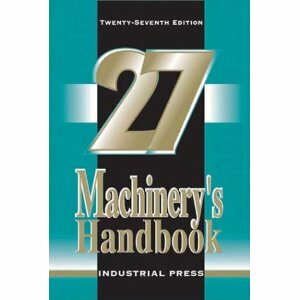 Extraordinarily comprehensive yet easy to use since it premiered, Machinery s Handbook provides mechanical and manufacturing engineers, designers, draftsmen, toolmakers, and machinists with a broad range material, from the very basic to the more advanced. It has always, and continues to provide industry fundamentals and standards while it moves into the 21st century with material reflecting technological advances and offering vast editorial improvements, making it the best tool...ever! A new more usable organization...every section has been reformatted so that you will never have to search outside of that area for information on the topic you are exploring. 30% MORE math coverage...from the basic to the advanced, you'll find fractions, positive and negative numbers, derivatives and integrals, analytical geometry, circular segments, matrices and engineering economics. New or revised material on...cutting tools, screw threads, symbols and abbreviations, threads and threading, disc springs, properties and materials, sine bars, and sheet metal. New individual indices for standards, materials, and interactive equations.